Let's take a trip back in time to the 1950s! And not just ANY 1950s, but the 50's of the 1970s - that very special 1950s we like to call HAPPY DAYS! Yes, that laugh-a-minit look at rock and roll, sock hops, and polio gave America its first glimpse of Ronny Howard's receding hairline, hoisted Arthur Fonzarelli to instant stardom, and introduced to the world the majestic, towering talent that is Ted McGinley. But that's later - after the show "jumped the shark." Which it ACTUALLY DID DO. What DOES Fonzie see in that crystal ball? Could it be Sullen Neanderthal Richie and a disturbingly jovial Ralph Malph? 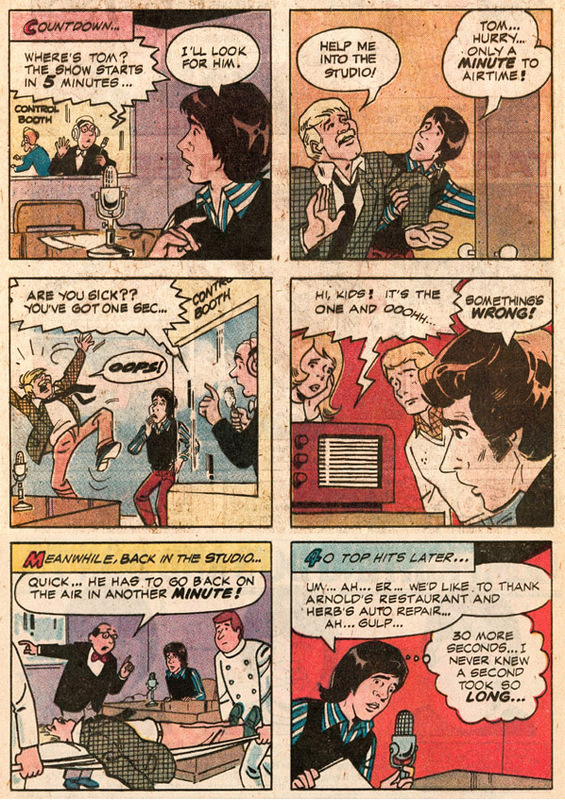 I'm sure this comic will be full of the same rollicking good-time fun everybody enjoys on the television! Nothing like seeing a high school pal get 86'd from a bar to give us that warm 50s sitcom feeling. But I'm sure this will get a lot funnier soon! 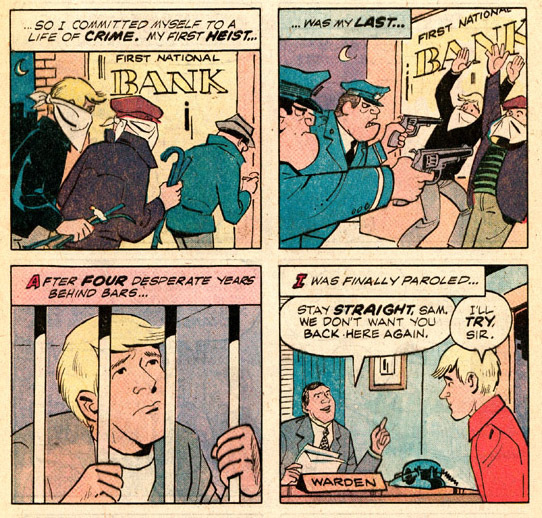 Bank robbery, four years behind bars, admonitions from the warden to 'stay straight' - why do I get the feeling that this is a "very special episode" of the Happy Days comic? Breaking beer mugs? This guy is even a failure at DRINKING. 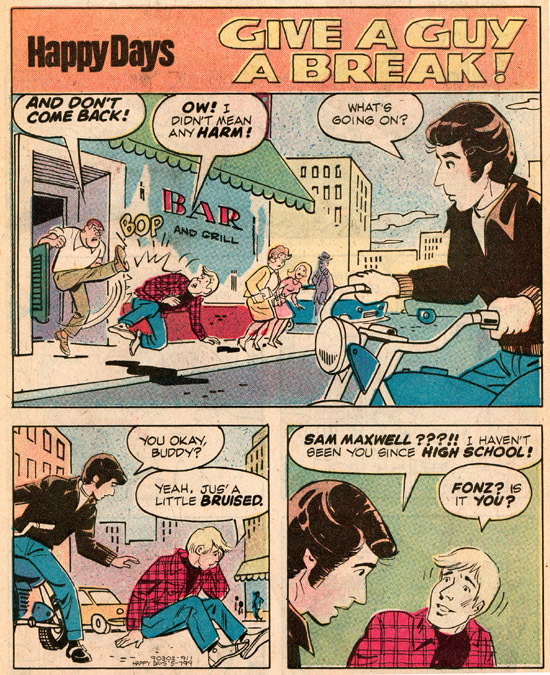 Can the Fonz straighten him out? Why yes the Fonz can- by making the Cunninghams do it. There's no problem a friendly TV family can't solve. Hey... HEY PAL. Way to start out your new life, by violating your parole. Good firm foundation for your new life there. 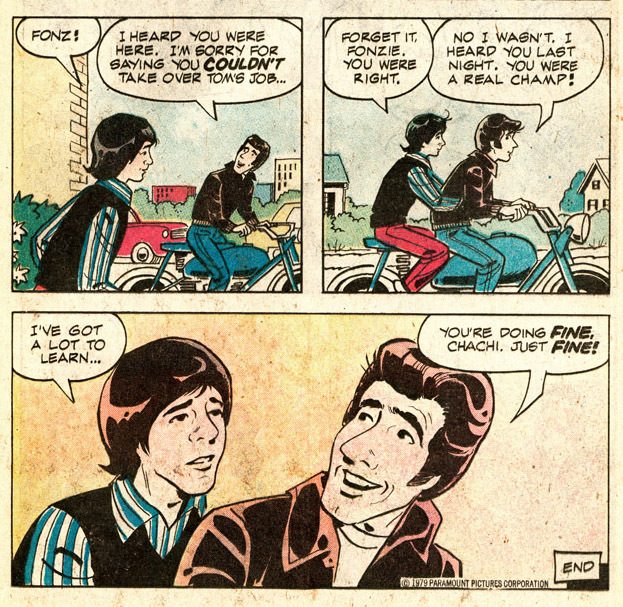 No, Fonzie! There's no time to smoke a big fat rock! You've got to find your pal! I'm not guilty of anything except bad judgement, and violating my parole, and breaking beer glasses, and robbing a bank. Just those things! Nothing else! Also great is the cake Mrs. C baked, which has a GIANT SIGN stuck in it. Couldn't write that in icing or stick a banner on the wall. Just jam a yard sign in it, Mrs. C! Well, that last story was really not very funny. 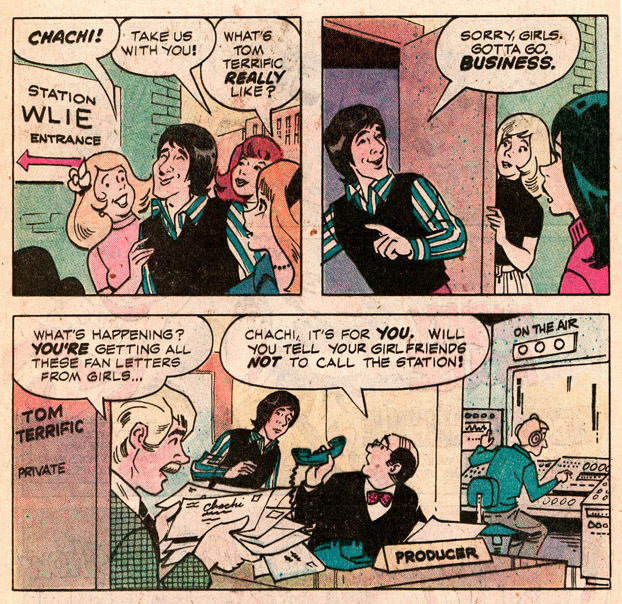 But this next story is about Chachi and how he gets a job at a radio station and immediately thinks he's a big star with his own TV show or something! That Chachi, he's always getting into comical situations. Oh no, the star DJ is sick and/or clumsy and Chachi has to fill in! It's Chachi's big chance! And we learn here that Chachi got his big chance, but he was only a mediocre DJ and they replaced him with somebody more experienced, and we all learned a valuable life lesson about experience and training and not taking too much medicine. Forget it, Fonzie. You were right. I have a lot to learn. I need to lower my expectations and learn to live within my limitations because this is the 1970s and we're running out of oil and in a recession and generally malaise-ridden. What an inspiring story! Thanks Happy Days! I'd kill myself, but I still need to find out WHAT DID FONZIE SEE IN THAT CRYSTAL BALL??? 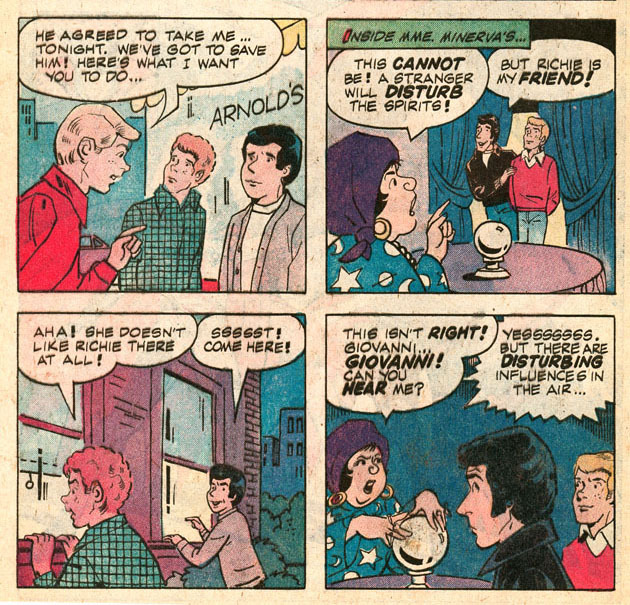 Why, Fonzie is being suckered by a crystal-ball-gazing spirit medium who's putting him in touch with his Great Uncle Giovanni from the old country! Either that or Mme. Minerva is running some girls on the side. 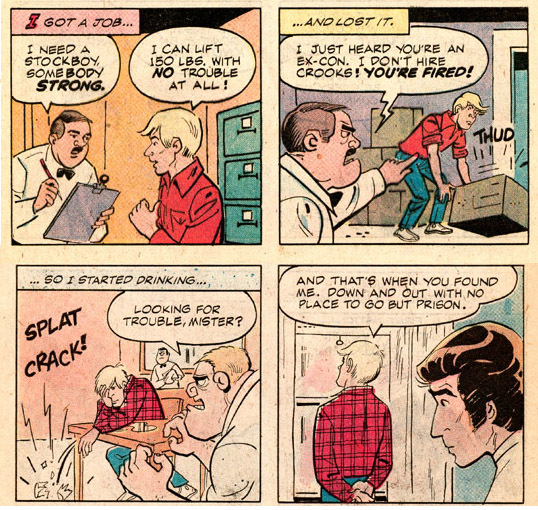 Since this is a Gold Key comic I'm voting for the spirit medium. 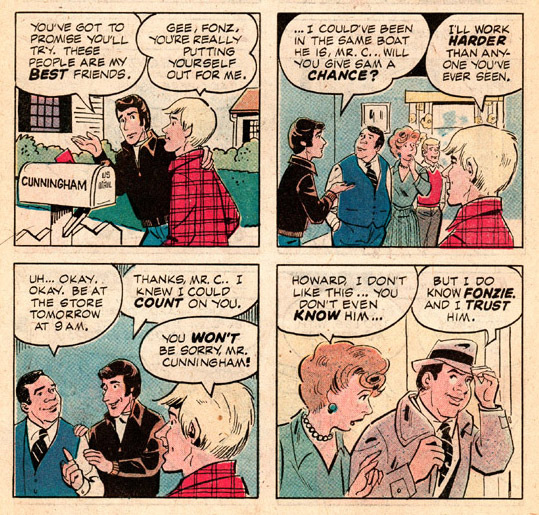 Richie and Potsie and Ralph, why they aren't going to stand for some mystic mumbo-jumbo putting the whammy on their pal Fonzie! 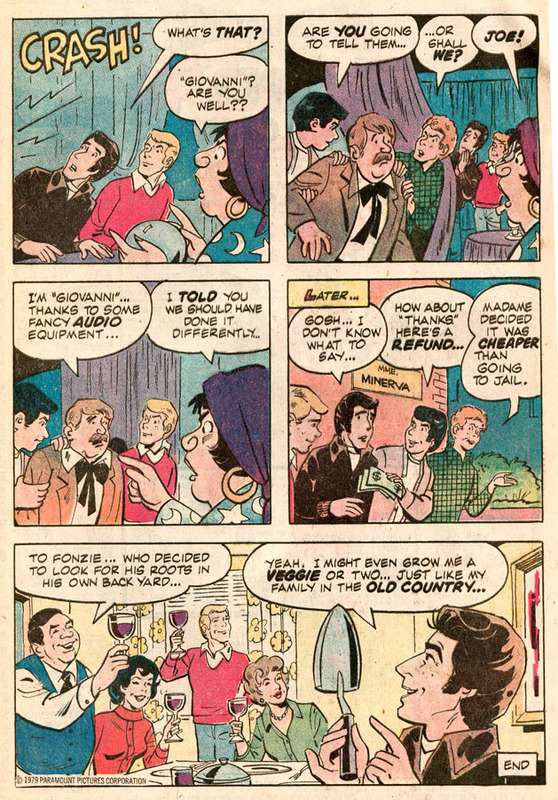 And after threatening the law on Mme Minerva, Fonzie gets his money back and everybody toasts Fonzie and his gulliblity. 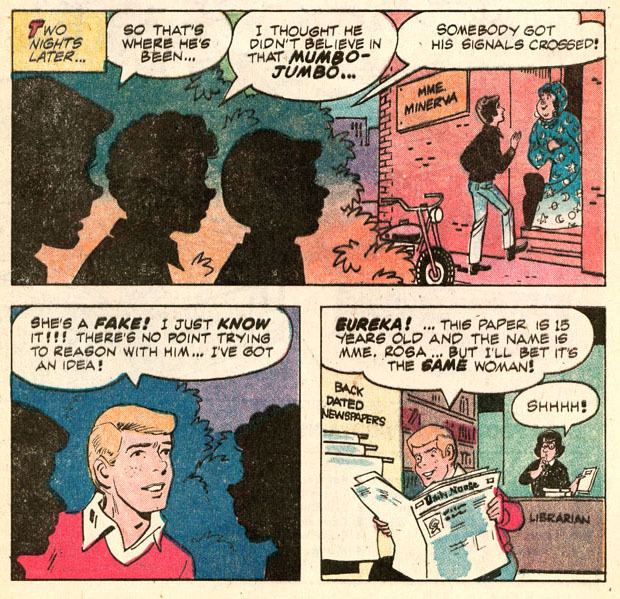 And that's your cover story folks, wasn't this issue of Happy Days full of the jukebox-thumping Rock Around The Clock fun seen in every episode of the TV show? What's that? It wasn't? It was kind of depressing and pointless? 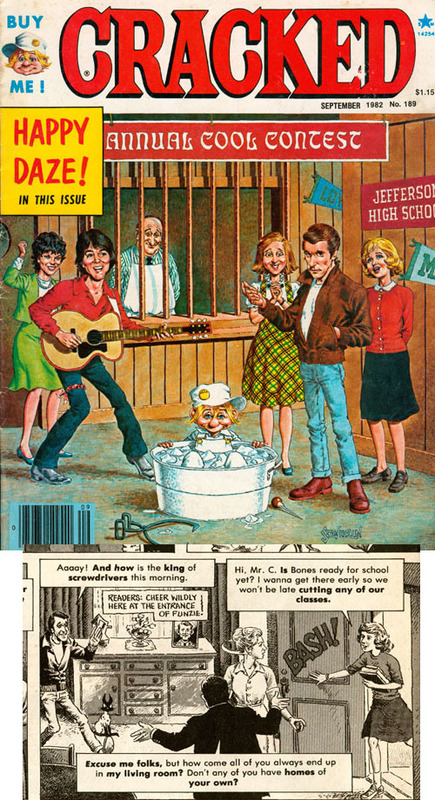 Well, for REAL Happy Days comics fun you only had to look a little to the left to the magazine rack and the latest issue of CRACKED, which devoted a remarkable amount of space to making fun of Happy Days. 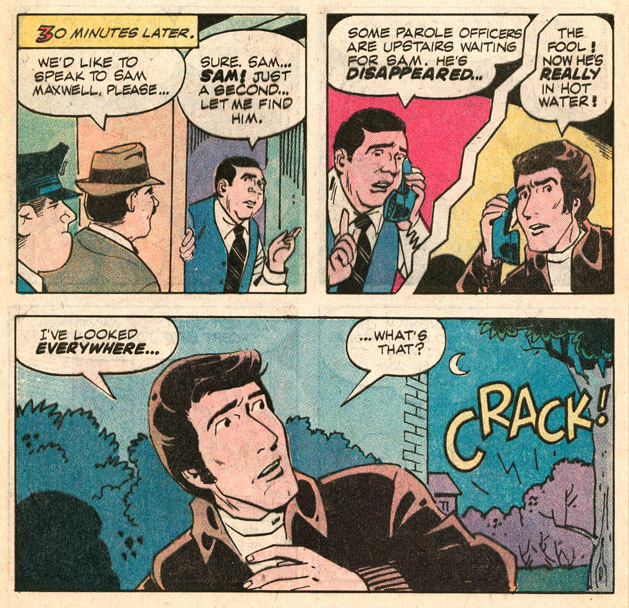 Seriously, every damn issue of CRACKED featured "Happy Daze", way past the general public's interest in 50s nostalgia and/or Fonzie (this issue dates from 1982!!) until sometime in 1983 when they switched to "A-Team", and until sometime in 1987 when they went out of business. Way to beat that dead horse CRACKED. Oh well, at least there's that great John Severin art. 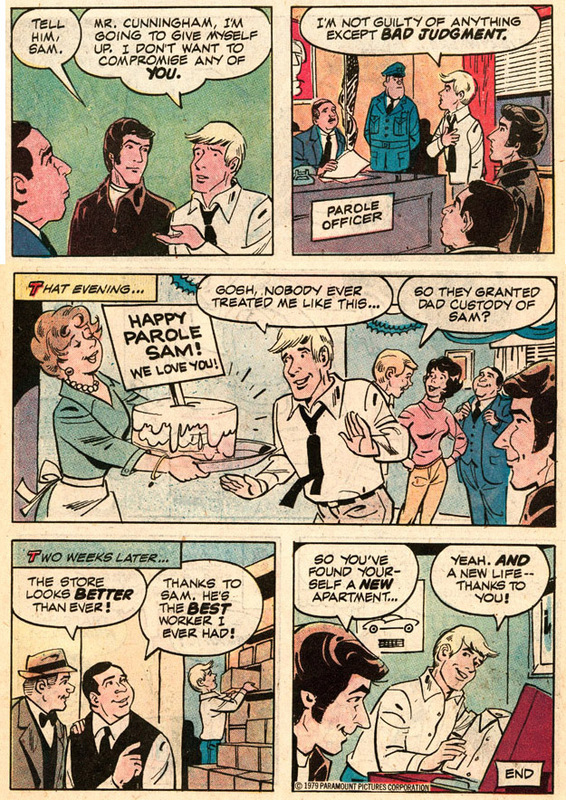 That's right, the spoof of Happy Days has better artwork than the offical licensed product. I bet Fonzie didn't see THAT in the crystal ball.